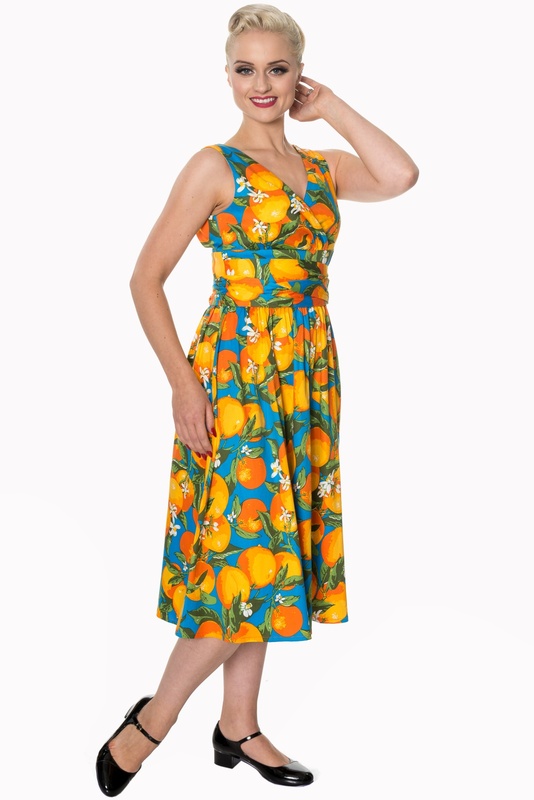 View the all new Dancing Days Laneway 1950s Orange Dress in UK Sizes 6-16. This dress is dramatically styled in a timeless 1950s silhouette and what better way to enter spring with a ton of oranges on you but why? 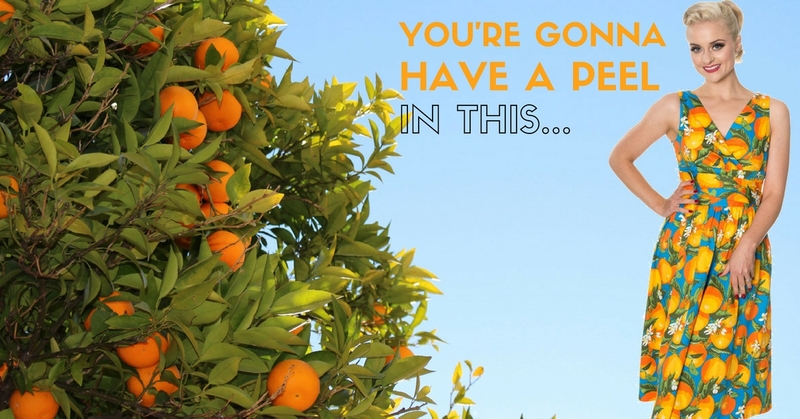 Well, Roses are red and berries are blue, Oranges are orange that's why they're so cool! This oh-so cool orange dress features a wrap V-Neck top with a horizontal waist panel which is wrapped around the waist and not to forget the customisable tie straps which'll nip you in at the waistline. 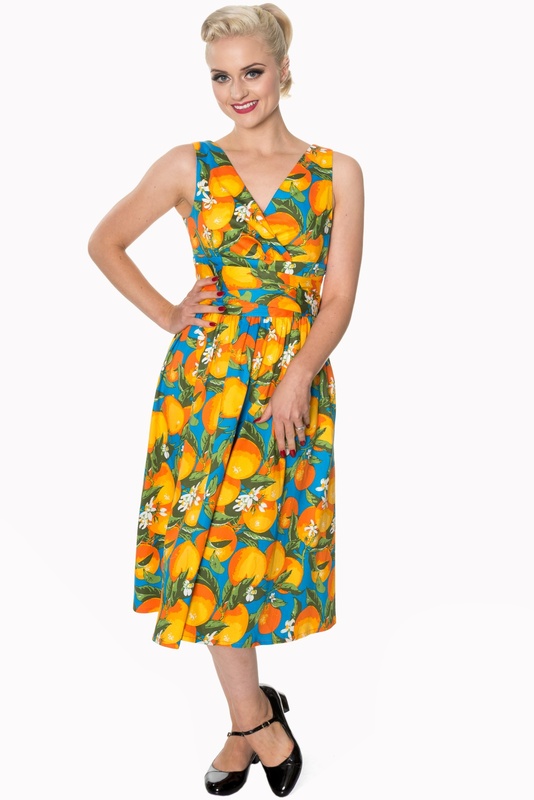 It's cut in a striking 1950s semi swing style and comes in a sleeveless bodice, and the fabric is crafted from a firm yet supple texture adorned with juicy oranges and leaves on a sky blue background. The pleated skirt flows to a calf-length style and there's also room to vamp it up with an additional petticoat which'll give it a lift and allow you to swing around ball room style. 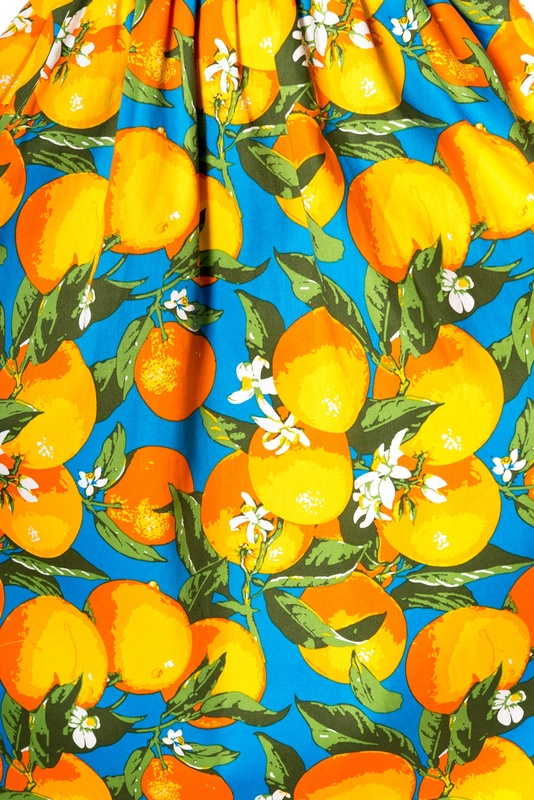 The Dancing Days Laneway 1950s Orange Dress comes in UK Sizes 6-16 but please note that there's not much room for stretch due to the nature of the fabric. 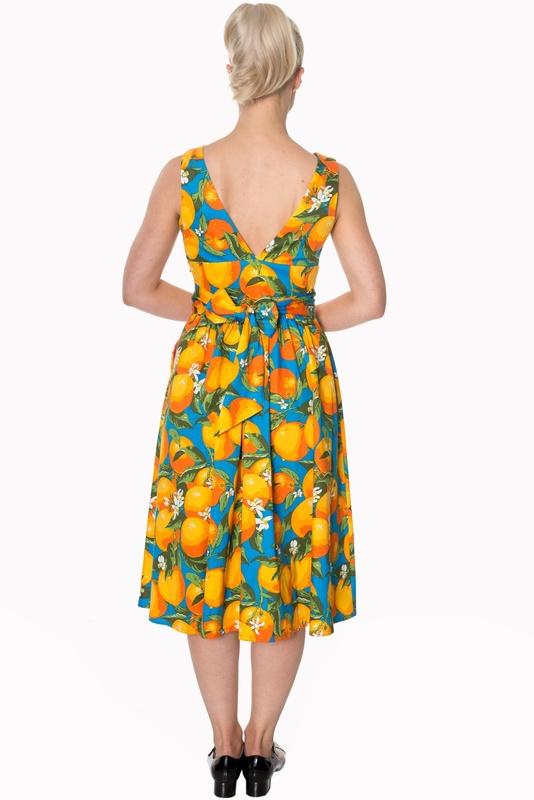 The delightful Dancing Days Dress is a pleasure to wear and it'll make you as irresistible as a juicy orange on a Spring/Summers Day. The dress fastens to the side for ease of entry with a concealed zipper and hook and features an open V-neck back. 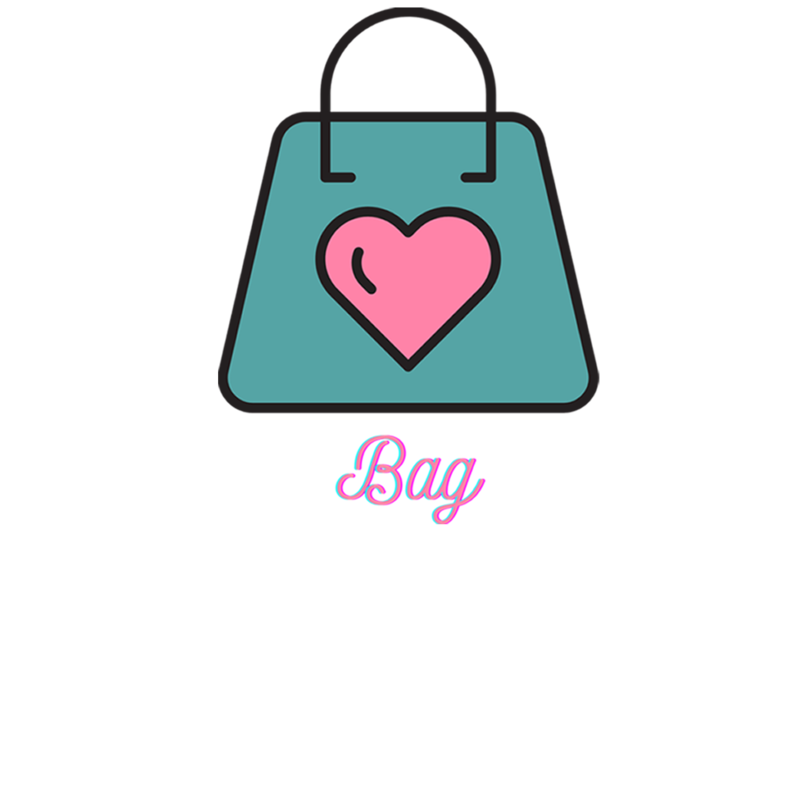 Brands such as Dancing Days by Banned really break the rules of modern day dressing and what better way to make an entrance with the Dancing Days By Banned Swing Dress. We're an authorised Banned clothing stockist and are proud to bring you the new season Dancing Days Collection at PDUK.